Mount Vernon Estate, the historic home of George Washington and his family, is situated along the shores of the Potomac River and is one of the most scenic attractions in the Washington, DC area. The following photos will give you a glimpse of this wonderful site. Mount Vernon Estate includes a 14-room mansion that is beautifully restored and furnished with original objects dating back to the 1740's. Visitors may tour the outbuildings, including the kitchen, slave quarters, smokehouse, coach house, and stables. Visitors tour the mansion as well as the outbuildings, including the kitchen, slave quarters, smokehouse, coach house and stables. At Mount Vernon you can explore the mansion, the outbuildings, the gardens and the new museum and learn about the life of America's first president and his family. George Washington planned the landscape of the Mount Vernon Estate himself. Four gardens showcase the plants that were at Mount Vernon in the late 1700s. George Washington distilled corn and rye whiskey and operated a water-powered gristmill near Mount Vernon, where he ground flour and cornmeal. A reconstruction of George Washington's whiskey distillery and gristmill is open to the public and features guided tours led by historic interpreters. The Mount Vernon Estate includes the mansion, the outbuildings, the gardens and the new Ford Orientation Center, a restaurant and gift shops. You can easily spend a full day exploring the historic site. George Washington died in the master bedroom at Mount Vernon on December 14, 1799. He chose to be buried on the grounds of the Estate. George Washington's tomb was completed in 1831 and Washington's body was moved there along with the remains of his wife, Martha, and other family members. George Washington was an important historic figure and Mount Vernon Estate is a special place to visit in the Washington, DC area. In 2006, Mount Vernon opened its new Ford Orientation Center and Donald W. Reynolds Museum and Education Center featuring 25 state-of-the-art galleries and theaters that reveal the fascinating story of George Washington's life through interactive technology and original artifacts. The museum features six permanent galleries and a changing exhibit including some objects shown at Mount Vernon for the first time. 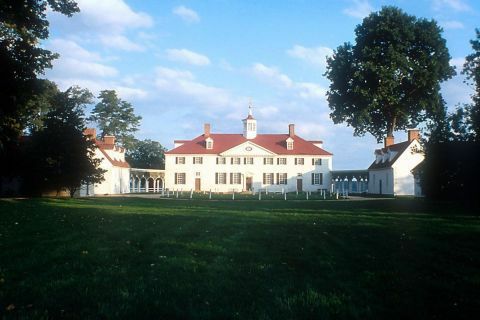 The 66,700-square foot complex was built under the four-acre pasture just inside Mount Vernon’s main gate, mostly underground in a low-lying area, to preserve the historical features of the Estate and Gardens. The museum at Mount Vernon displays a collection of more than 700 objects including furnishings, china, silver, clothing, jewelry, Revolutionary War artifacts, rare books and manuscripts, and other personal effects of the Washington family. The building also serves as Washington's presidential library with classroom space and computers that will provide access to more than 20,000 letters written by Washington during his lifetime. Life-sized bronze sculptures of George and Martha Washington and Mrs. Washington’s two grandchildren, Nelly and Washy, welcome visitors to the Ford Orientation Center at Mount Vernon. Mount Vernon in Miniature, completed in 1998, is an exact replica of the Washingtons’ home. See the mansion at a scale of one-inch-to-one-foot, including intricate details, such as turning door knobs, latching latches, and windows that open. Hundreds of objects including oil paintings, porcelain, and books are featured in the Miniature.Mechanized walls that recede allowing visitors to peek into rooms not typically on display such as the cellar and the recently refurbished third floor bedchamber where Martha Washington moved after George Washington died.Valued at over $500,000, Mount Vernon in Miniature weighs nearly 1,500 pounds and measures ten feet long, more than eight feet high, and approximately six feet wide. It is displayed in a state-of-the-art glass case that extends 16 feet to the ceiling and is lit from above.Since 1998, Mount Vernon in Miniature has traveled to a dozen museums and presidential libraries throughout the United States. A gift of the People of the State of Washington, it now permanently resides in the Ford Orientation Center at Mount Vernon. 999: GEORGE WASHINGTON, Charles Willson Peale (1741-1827), American Watercolor on ivory, 1776. The museum at Mount Vernon displays several portraits of George Washington. This gallery depicts one of the dinners that Washington held every Thursday when congressmen and other government officials were invited to dine with the President. The First Couple entertained guests in a formal dining room with French porcelain china, silver candlesticks, and finger bowls. This gallery showcases the first life-size model of Washington and depicts him as a 19-year-old surveyor among three dimensional trees. Forest sounds and moving animals set the stage for 18th-century western Virginia, where visitors see Washington’s original surveying tools and learn how to conduct a survey themselves. This tastefully decorated sitting room is actually a theater which shows a History Channel film highlighting the courtship and marriage of the Washingtons along with major events during their 40-year romance. The film is narrated by Tony Award-winning actress Glenn Close. This is a portrait of Martha Washington and the gown and jewelry that she wore when she and George were married. This display is part of a gallery that presents the personal objects used and worn by George and Martha Washington, their children and grandchildren. Objects in the gallery range from George Washington’s shoe and knee buckles to Martha Washington’s earrings and necklaces. The final life-size figure shows Washington taking the oath of office on a replica of the Federal Hall balcony in 1789. Visitors have a chance to “step into Washington’s shoes” by placing their hand on a reproduction of the Bible upon which Washington took the oath of office. Following prompts, they recite the presidential oath, "I do solemnly swear that I will faithfully execute the office of President of the United States, and will to the best of my ability, preserve, protect and defend the Constitution of the United States."